What do you get when Thai green curry and vodka soda with lime have a delicious little baby? You get this cocktail, y’all! I had this epiphany in the car driving back from the lake house with my girl friend, hi Wendy! I truly enjoy a spicy cocktail. Not the burn your face off kind of spice but, that nice heat that hits the back of your throat and stays on your lips for awhile. I particularly enjoy it when I’ve found the perfect balance of tart and sweet to go with it! This bevy fits the bill, guys. It began with my love for the infused simple syrup. I decided that basil would spice up nicely and it seemed natural to go to Thailand with this drink! I thought about it for a stretch because you know, driving and ended up with the skeleton idea for this bad mammajamma! For the simple syrup, add sugar, water and 5 sprigs basil to a small sauce pan. Bring to a boil. Once sugar is dissolved reduce heat and let simmer for 20-30 minutes. Strain basil leaves and discard. 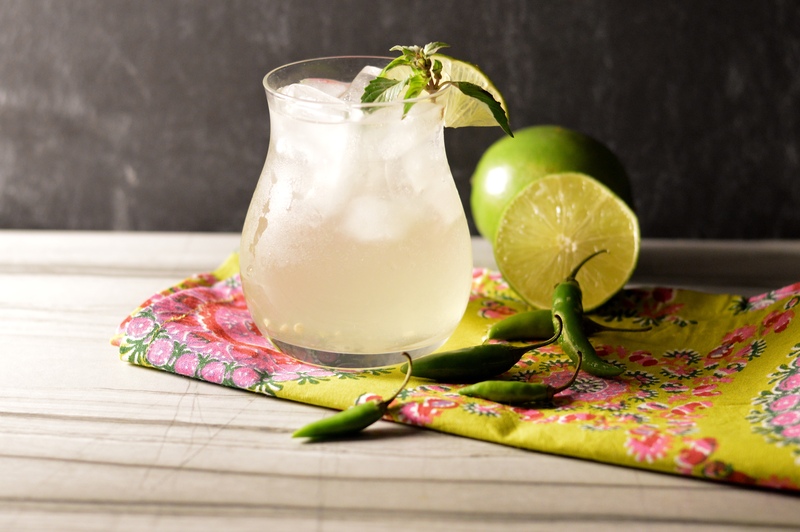 In a muddling glass, place sliced chilies (use one for mild and 2 for a bit more kick), the juice of half a lime, 1 shot of the simple syrup and mash with your muddling tool until sufficiently macerated. Add 3 shots vodka and give it all a good swirl. pour concoction over two ice filled glasses. The glasses should be about half full (I used 8oz sized) Add coconut water until you are about 3/4 full and top off with club soda. Garnish with a lime and a basil leaf or two. Lightly mix and enjoy. This refreshing beverage is TO DIE FOR. Trust me and try it. It tastes like Thai food, not too sweet and perfectly spicy… you will not regret it.